And now we wait for the speech of a lifetime. The make or break — defining speech. We wish this unreal set of expectations on no one. Let me renew this debate with trilogy of blogs over the next week. First with a set of charts and diagrams laying the foundation for the daunting statistics that face us. 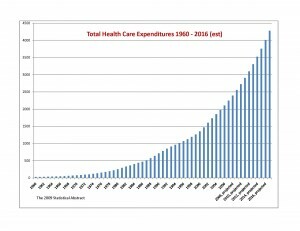 First consider this simple chart plotting the inexorable rise in yearly total health care expenditures from 1960 to 2016 (estimated). There is barely a perceptible sag at about 1995 . To imagine an external force (the government) having any measurable effect on this curve stretches the imagination. We will expand a discussion soon on the nature of open and closed systems. The basic flaw in this entire “top down” approach to the “health care crisis” is based on a faulty concept of “fixing” a closed system. This is where all variables are known and can be controlled. Paul Krugman, in a brilliant New York Times Magazine piece talked about the failings of the science of economics. What underlies his lamentations is “the dismal science” applied to an open system. An open system is filled with chaos, human frailties and uncertainties. Much like trying to predict the weather for the next month. Or worse … predicting the rise or fall of the Dow Jones in the next 3 months. We cannot know all variables. We have no control over this system. It supersedes any Newtonian principles. Past performance is no guarantee of future performance. Medicare, that 120 mile per hour bullet train, is hurtling towards derailment — insolvency — going broke. And we want to expand Medicare for all? This is a most impressive feat of prestidigitation. This may seem terribly unjust and undeserved, but with the most noble of intentions, this is another déjà vu — voodoo economics. 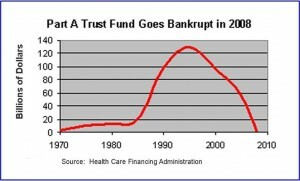 Look at the graph illustrating a prediction from HCFA (Health Care Financing Administration) projections in 1999. 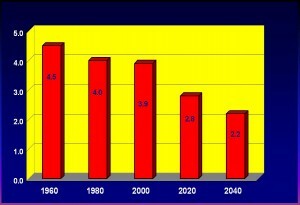 It shows the prediction of insolvency in — 2008. And here we are in 2009. Current revisions give us a few more years depending on various dubious assumptions. But it is coming for sure. We we can hardly assume we can “bend the curve.” Can we save money by tackling waste, fraud and abuse? Or we could save money simply by not paying the providers? Even more compelling statistics. Increasingly, fewer and fewer workers today pay into the system while more and more workers draw down. We are a scant two years away from the first of the baby boomers turning 65. The “withdrawals” from the system will accelerate for the next 20 years. And just at the very time when the load increases significantly, the base contracts. How can this be solved? Let me quote from the former maestro, Alan Greenspan. Remember, it was not in too distant time when he could do no wrong. That was before a most ignominious fall from grace. But we ignore these words at our peril. •What I have argued for quite a significant period of time is that we have underfunded for Medicare, which is a very significant part of the numbers that you are concerned about, by half. •In other words, in order to actually honor all of the promises that are being made to the next generation, the Baby Boom Generation who are retiring, we would have to either cut benefits by 50 percent, raise taxes to a point which probably cannot fundamentally be sustained, and therefore we are looking at as the underlying meaning of these types of reports, is we essentially promised to the American people far more than we can deliver. So when we hear so often that Medicare has low administrative costs let us consider this conundrum. Why is Medicare going broke while insurance companies prosper? I will leave it to others such as Yobie Benjamin of SF Gate to utter the more profane announcements of executive compensation for health care company CEOs . Just consider where your premium dollars are going. So I will repeat again, insurance companies will not lose. A bad bill with all its compromises will be worse than none at all. We are a nation that continually seeks legal redress as a means of justice. There oughta be a law… But at this rate I can almost guarantee you any final bill will be the insurance enabling act of 2009. We will all feel hoodwinked. How could this have happened? Here is what Congress should legislate. If health care is so central to the national purpose and survival, we should treat to all insurance companies as public utilities. They should be highly regulated like any and all common public utilities. I predict on Wednesday night, the president will “hit a home run.” Great pronouncements of progress will be made. At what price? Stay tuned for a series of discussions moving towards more metaphysical and philosophical views of true optimal health and well-being. The discussion throughout the ages. We stand to learn much from historical precedents. I promise you an interesting trip. Thank you for carefully reading and appreciating our posts.